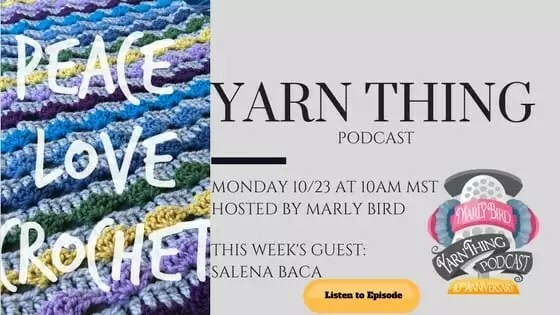 It’s time for Thursday Trivia with Marly Bird and Red Heart Yarns! Our winner this week for Thursday Trivia with Marly Bird and Red Heart Yarns is Debbie D. Congratulations! You will be getting an email from me shortly to get your mailing address, or if you see this before you get the email feel free to email me with your mailing address and phone number to submissions@marlybird.com. Please put in the subject line that you were the Thursday Trivia winner. For you to have a chance to win a prize package of $25 from Red Heart Yarns you must answer this week’s trivia question correctly. Make sure you read to the bottom of the post to get your clue for where to find the answer. Rafflecopter will help us choose a correct answer randomly to win, be sure you enter your email address so we can verify the winner. You have one week to answer the question. Winner will be announced the following Thursday at the launch of next week’s question. Be sure to come back and see if you were the winner. Please comment on this blog post (and enter the Rafflecopter widget)–What is the name of the crochet sister to the Big Comfy Sweater Pattern? Help spread the word about #ThursdayTrivia. You can find each week’s question on the blog under Thursday Trivia. The Thursday Trivia Giveaway with Marly Bird and Red Heart Yarns is open to US and Canada addresses only. One winner will win a $25 prize package from Red Heart Yarns. This giveaway ends on 11/1/17 at 11:59 pm Mountain US time. To enter, use the Rafflecopter form below. If you are on mobile and have difficulty entering, please use a desktop computer to enter. You must enter a blog post comment on THIS post and click the Rafflecopter button to be eligible. Click the button below to enter your information to be entered to win. Comfy Crochet Sweater is the sister sweater. The Comfy Crochet sweater is the sister. The sister’s name is the Comfy Crochet Sweater. I’m going to make a set for my sister and myself too! It should be fun because my sis is only 5′ tall! Comfy Crochet Sweater, both knit and crochet versions are so cute! This is a duplicate because my phone is nuts and the first entry didn’t show up on my phone until I entered it again. I don’t get along with technology sometimes! Sorry! Comfy Crochet Sweater is the sister. The Comfy Crochet Sweater is the sister pattern…..
the comfy crochet sweater is the sister sweater to the comfy knit sweater.